Diet - it is a huge burden on the human body, но также это еще и испытание силы воли и веры в себя. В классическом варианте диеты запрещается все сладкое и мучное, что многих сладкоежек повергает в уныние и депрессию. Is it possible to lose weight, but do not deny yourself the favorite sweets? Можно. Chocolate diet confirmation. Chocolate - It is surprisingly tasty treat, Loved by many people. But chocolate - it is not just tasty, it can be successfully used for, to get rid of the extra kilos fast. 1. Strict. Diet comply 1-5 days. As a result, the weight loss will be from 3 to 6 kg. Contraindications to the diet are - hypertension (so as chocolate improves pressure due to caffeine contained therein), diabetes, pancreatitis, diseases of the liver and gastrointestinal tract (gastrointestinal tract). But it can be dangerous and totally healthy person, if he will use it for a long time. As part of the daily diet 80 g. bitter chocolate and black coffee without sugar. you need to drink water near 2 liters per day, be sure to clean and non-carbonated. Chocolate consumed in divided doses per day, each meal, washed down with a cup of coffee. Eating chocolate will reduce the feeling of hunger, Coffee and improve bowel function. Such a diet will require you to great willpower and discipline. 2. Italian chocolate. This method is the most safe and has fewer restrictions, than previous. Diet comply within 5 days, for which you can lose up to 5 kg. This method is possible starvation and welcome snacks chocolate between the main meals. The daily food intake should include: 30-40 g chocolate, vegetables and fruits, negazirovannaя water, pasta, as well as berries and popcorn. During the day, allowed the use of still and sparkling clear water. Such a diet is more forgiving, even it helps to lose about the same amount of kilograms. The choice is yours! Using chocolate, as a means to combat obesity, you will face even with the other useful properties of this product: it helps to cope with stress and faster to recover psychologically, It stimulates the release of endorphins, and it is very important for losing weight. 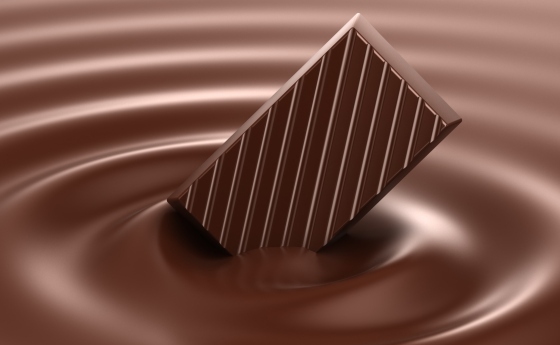 Chocolate is useful for the heart, since it includes antioxidants, anti-inflammatory agents. Kaushal chocolate, grow thin and be healthy!